Yellow Twig Dogwood is a deciduous shrub with bright, ornamental twigs. Plant several along a property line in concert with Red Dogwood for a decorative contrast during the drab, winter months. You could also plant just one in view of a window where its winter color can brighten your cold season landscape. 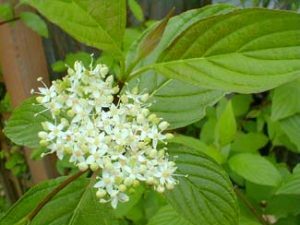 Your Yellow Twig Dogwood Shrub is sure to be a delight for your yard with its four-season interest. Two-inch clusters of tiny, white flowers appear in spring with occasional, recurrent blooming that lasts into summer. The tale of yellow twig dogwood’s contribution to the landscape begins in late winter to early spring, when the golden color of its bark shines brightest. Flat-topped clusters of white flowers provide interest later in spring, as do the plant’s white berries in summer. The summer green of the leaves yielded to a yellow color in autumn during my own plant’s first year with me. Grow these winter wonders in planting zones 3-8. Grow yellow twig dogwood shrubs in full sun for brightest bark color. They will tolerate partial shade, but reduced sunlight exposure may also reduce the brightness of their golden bark color. These bushes are good plants for wet areas (for example, wet spots where homeowners may wish to establish woodland gardens), where other plants would suffer from a lack of drainage. Mix humus into the soil to keep your yellow twig dogwood shrubs well fed. The widely-spreading root systems of yellow twig dogwoods make them good choices to plant on a banking, where erosion control is an issue. Yellow twig dogwoods serve as specimen plants in winter, when (outside of evergreens) there is little plant color in the yard. Plant them where you can enjoy them — e.g., within view from a window, from which you can see them pushing up through the snow. Use yellow twig dogwoods in combination with red twig dogwoods for an even more stunning winter display. With or without red twig dogwoods, yellow twig dogwoods look best when planted en masse. Since the gold color of this bush’s bark is brightest on newer branches, care consists largely in pruning yellow twig dogwoods. Prune in late winter. For maximal color, prune out 1/3 of the oldest branches every three years or so. Such pruning will promote new growth. If you are interested in planting any kind of shrubs, please give Arbor Hills Trees & Landscaping a call for the best prices and quality work.